It’s Friday, which means pizza well it did but more often then not it’s been sushi the last few months since the girls found a favorite veggie sushi they are loving. Don’t worry we still get our pizza, hello it is the year of pizza (our Family Foodie Date theme for this year), but it’s during the week or Saturday. I got this pizza made before it got too dark last weekend so I could photograph it finally! I can’t tell you how many times we’ve made pizza this year and I can’t get photos because it’s so late at night, and or we have friends over. Not that friends and family have stopped me before but when it’s late it takes a lot more work and hasn’t been working too well. Back to this pizza… so good I had to share it right away on Instagram. Including lots of stories on that crust, yes I got a little crazy but seriously could have put it on live probably and squished, pulled apart, admired, and dipped that crust for hours enjoying each bite. Oh I did but only did one story, but others were loving it too so of course I had to get it up on the blog today. Oh yes I may have been enjoying a glass of wine while I was making it which is why I also shared the photo of what happens when you put your head over the grill when you open it to get a video, yes singed my hair, eyelashes, eyebrows. I always get questions on the crust and the recipe has been up on the blog for over a year and it so much easier then you might think! The only thing it does take is time, you need to make it 3-4 hours ahead of time. Trust me though it is SO WORTH IT!! When it comes to homemade pizza night we all have our favs but we also like to switch things up. I like to switch things up with in season produce and my mood. The garden is booming with pepper, beets, cabbage, kale, chard, zucchini, squash of all kinds, tomatoes, and cauliflower right now. We just used up all the broccoli so that was out, and I’ve already done a beet pizza. We did make a classic margherita with the tomatoes and test out a new cheese but I had to make a squash pizza! Squash is one of my favorite foods of fall, right there with apples and pumpkin but I haven’t gotten there yet this year. Well wasn’t until the cool temps hit this week! Really it’s all about this crust, well it makes if for me but this simple combo of toppings is in season and style! A little extra virgin olive oil, diced butternut squash, garlic, little red onion, fresh thyme, fresh mozzarella (dairy free/vegan), and baby arugula. Yes if you need to justify pizza it’s topped with veggies and just a little cheese. For me this is one of my all about balance and I savor every single bite with a wine. I crave this crust and homemade pizza night more than sweets lately which is crazy but I have noticed my tastes shift over the years. Mostly in the decrease in pints of ice cream in the fridge and stashes of chocolate. Haha! Maybe it’s just a phase. Although so much has changed in my eating this year, the biggest is sourdough! Aside from that being a lot more relaxed when it comes to food and enjoying it more, but with that the things I would have over indulged in in the past I’m not. Sorry for the pic overload but I just couldn’t get through the pictures and delete anymore. I was drooling and getting side tracked and thinking about the crust all over again. If these pictures of the crust don’t have you making it I think I failed at really capturing it because it left me speechless. I may just have to jump in and do videos because this pizza deserved the star roll in a video. Happy Friday! I hope whatever you’re doing today, this weekend, next week you enjoy each and every day to the fullest and it brings you happiness! 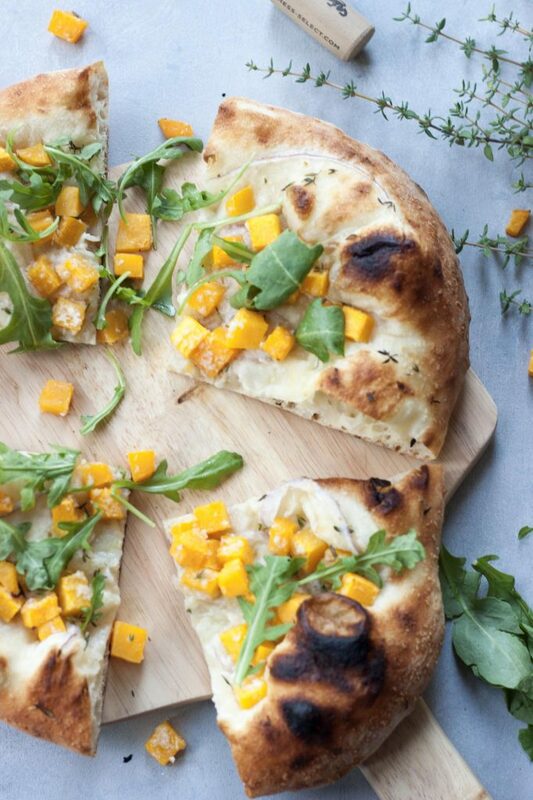 Butternut Squash Neapolitan Pizza will have you rethinking take-out! Starting with homemade crispy outside chewy inside Neapolitan crust. Topped with a little extra virgin olive oil, garlic, a little red onion, fresh mozzarella (dairy free, vegan friendly), butternut squash, fresh thyme, finished with baby arugula after baking. If making our Neapolitan Pizza Crust if using, you will have to make the dough 3 hours, 4 hours is best, ahead of time. It doesn’t take long to make you just have to let it rest and rise. Heat grill or oven, with pizza stone placed inside, to 550F if using my husband’s crust recipe otherwise heat per your pizza crust directions. Toss or roll your pizza dough and place on a piece of parchment paper on a non rimmed baking sheet. Brush crust with olive oil, staying about 1/2" from the outside edge. While you don't want too much olive oil you want enough to have a layer otherwise the crust, if using our recipe will get really puffy (more so then shown) and you may have a big bubble. Grate garlic over the crust and add onion slices. 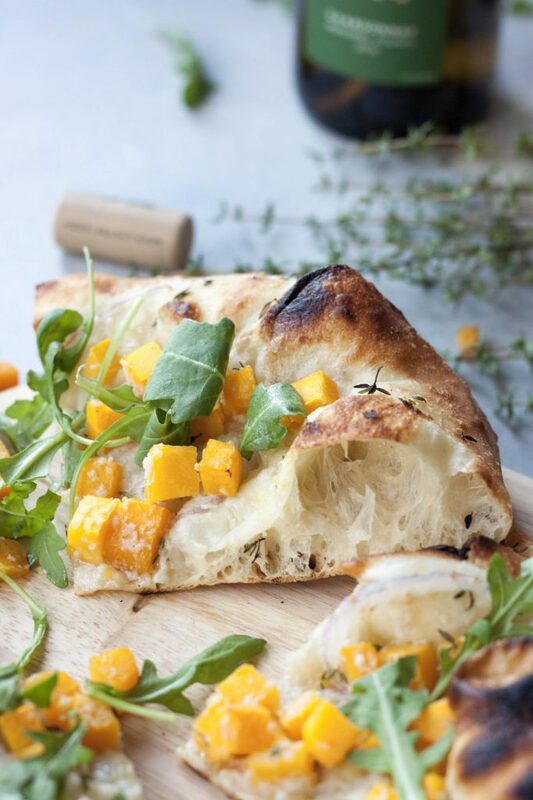 Top with butternut squash, grated or pieces of fresh mozzarella, and fresh thyme (stems removed). Add a sprinkle of sea salt and fresh ground pepper. Place pizza, keeping it on the parchment as it will easily slide on and off your pizza stone, onto the pizza stone. Check at 6 minutes, the crust should start to be golden brown and slightly blackened on the outer edges like a traditional Neapolitan pizza. It can take up to 8-10 minutes depending on the temperature of your grill/oven. If using your own crust bake per your crusts instructions. Remove pizza, sliding a baking sheet under the parchment paper. 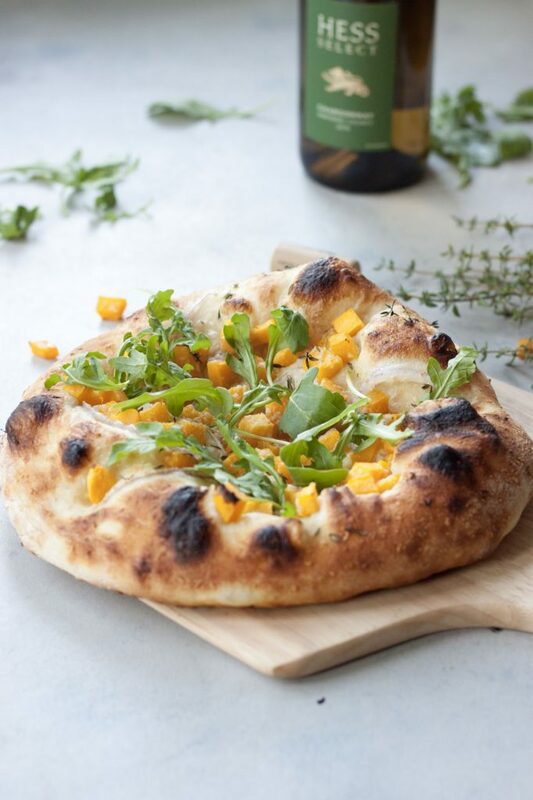 Let pizza cool a minute or two before topping with arugula. If you want to grate the Miyokos Fresh VeganMozz I find it works easiest from the freezer, or pulled right from the refrigerator if not frozen. Someday you’ll have to join us for pizza night! 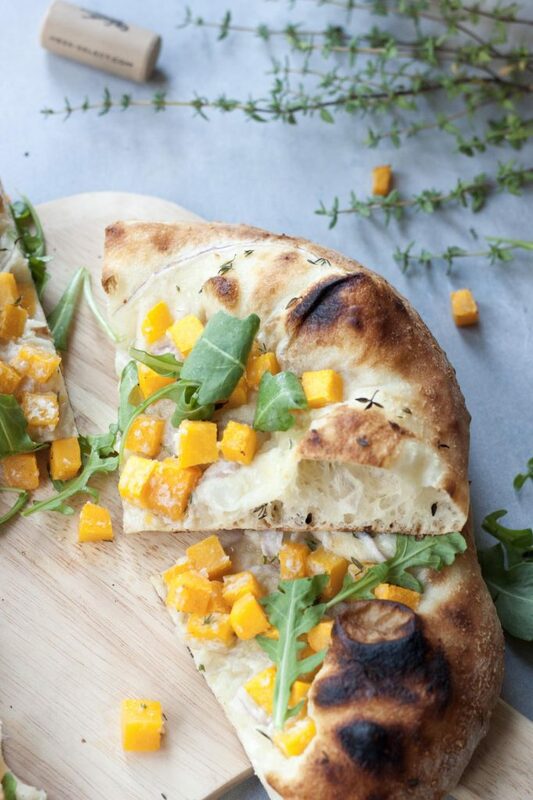 We made a butternut squash pizza last year and I was super quizzical at first but it turned out SO GOOD. Shocked me, and my husband totally loved it too! It really is simply delicious! 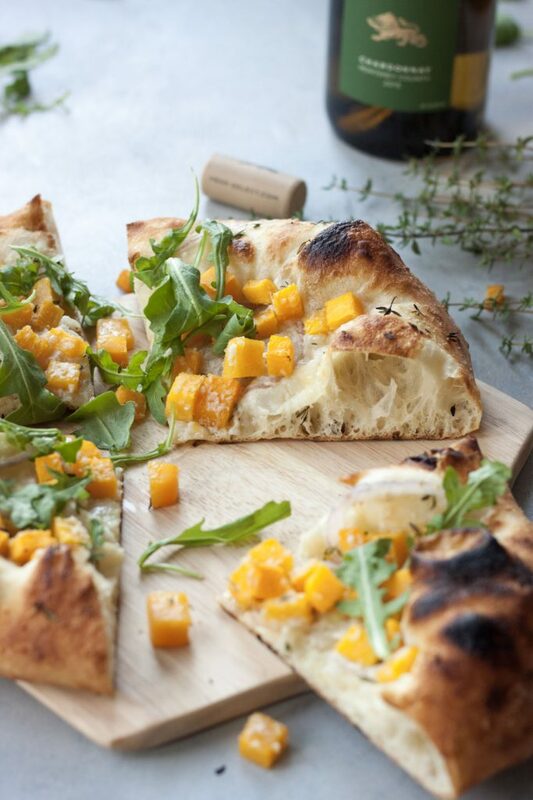 Such a neat idea to add butternut squash to pizza! Sounds like a great addition for fall! We haven’t gotten a butternut squash in our farm share bag yet, but I’m sure it’s coming any day now. I’ll have to come back to this recipe when we have it! You’ll have to let me know if you make it or what you make with your squash! I loveeee a chewy bubbly pizza crust!! And I’m so excited that butternut squash season is upon us!! I think, know, you’d love this crust! Yes I’m trying to figure out just what I want to do with all the squash we have in the garden. We just didn’t get many spaghetti squash this year. OH MY! Loving the simplicity and the yummyness of this!! Love me some butternut!! It’s not that hard, although my husband usually makes the crusts since he likes to. Let me know how things go if you make it! We often do pizza on Friday at my house. This is such a creative idea! Isn’t pizza night the best?! That crust looks dynamite! Also love the topping combo! Thank you, the crust still leaves me speechless! I can’t get over how fluffy this crust is! And I’m sure it was worth the wait! It’s not hard at all and still leaves me speechless, it’s so good! That crust looks absolutely incredible!! I’m thinking some Saturday pizza is in order for sure. 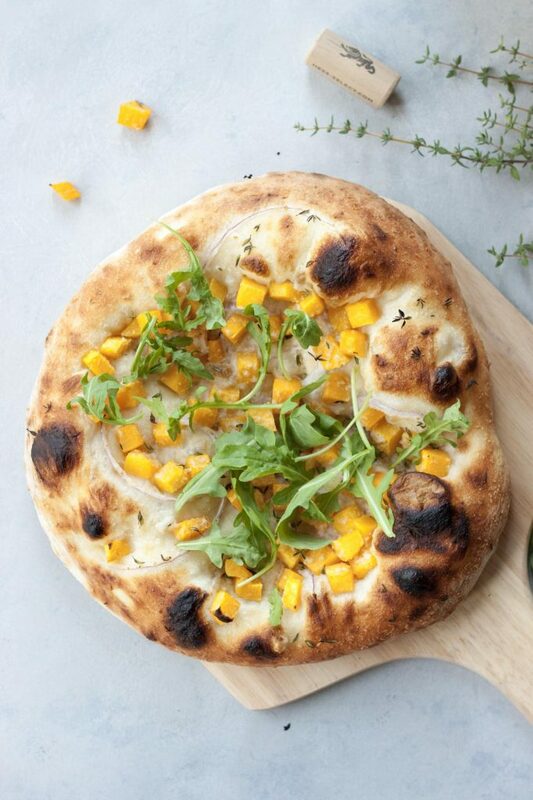 I love squash too, especially this time of year and on pizza? Even better….I will try not to singe my hair and face..hahah. Be careful! Yes be careful! Hope your pizza night turned out well and you enjoyed it! Another delicious pizza recipe! I’m gonna have to try adding butternut squash next time we make pizza! Let me know how it goes when you do! You have the best pizza recipes and this one is no exception. Yum! jill conyers recently posted…How Much Exercise Do You Need To Get In Shape? Thank you, we love our pizza and have fun with it! i usually do this crust pizza at home but i’d so very interested in trying this crust. You’ll have to let me know what you think if you try it!